Bliss of Varana. . .
Varanasi is the link between the earth and the sky as well as birth and death. 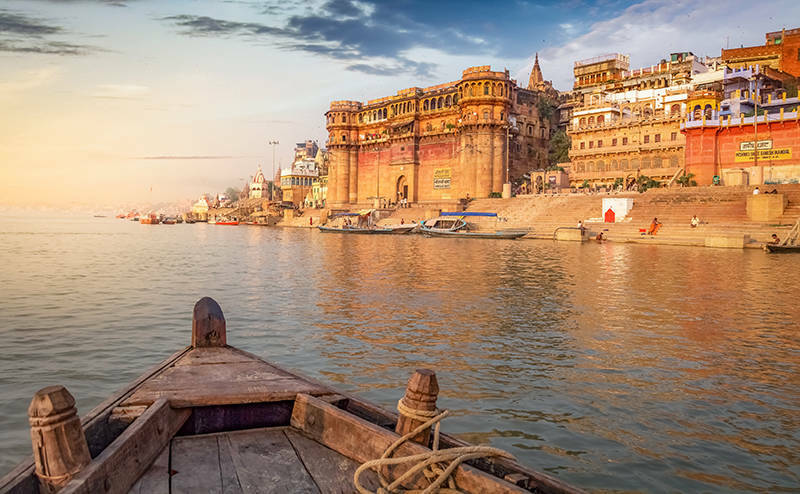 The oldest city of India, also known as the gateway to moksha, Varanasi signifies eternity; the cycles of birth and death and the life-in-between. Known as the abode of Shiva, Varanasi is the soil where the seeds of spirituality lie in every nook and corner. With Kashi Vishwanath as its centre, it is considered to be the 12th Jyotirlinga of Lord Shiva and the oldest surviving city in the world. Devotees throng the bylanes of Varanasi to celebrate its age-old heritage and beauty. The narrow lanes and an old heritage fort across the river Ganga showcase its culture. All across the city, are the shops selling traditional Banarasi sarees and carpets. Apart from Kashi Vishwanath, Sarnath is a revered place, from where Lord Buddha first preached on enlightenment. It has an age-old stupa with a maze and strong pillars, with his sermons written over them. One feels a connection with the Ganga while attending the Ganga Aarti, an event marked by a boat ride over the river, which provides a panoramic view of Varanasi. This legend of Varanasi that I had heard and read about through various sources prompted my visit to this glorious city by train, which I took from the New Delhi Railway Station on an autumn afternoon, post the festival of Devo Ki Deepawali. Devo Ki Deepawali is held during Kartik Purnima in Varanasi. The whole city gets lit up to welcome the devatas, who seem to descend upon the city to celebrate the festival, signifying the victory of good over evil. It is celebrated to mark the day when Lord Shiva’s son Kartikeya killed the demon Tarakasur, who was causing an uproar on earth. Apart from spirituality reaching its peak at this time, the festival is also famous for a drink called ‘malaio’ which is a mixture of milk with malai (cream), and it is the traditional welcome drink for all the visitors. From Kabir, the mystic saint on the ghats, and the Buddha at Sarnath, to the tinkling of the ghungroos of Kathak dancers and the melodies of Indian classical music, the city comes alive in its diversity, not to mention the boat ride over the Ganga. My visit spanned a short two-day stay in a simple accommodation at a motel. A brilliant guided tour began with salutations at the Kashi Vishwanath Temple, where one can experience the joy of Shiva through the Rudrabhishek ceremony. Next on the agenda was Sarnath, at the feet of Lord Buddha, where the chants of ‘Om Mani Padme Hum’ seemed to resound in my ears. The autorickshaw in which I was travelling, took me into the world of handlooms and handicrafts, which is a hit with the tourists. With this, my first day came to an end. The next day began with a visit to the ghats, which are named after the many saints, who preached wisdom on the banks of the Ganga to the population of the city. You can take a boat ride to visit these ghats, which are innumerable, and so every ride is a new one in itself. People take a holy dip in the Ganga, the purest river of India, to cleanse their past lives’ karmas. The decorated temples, boat rides over the Ganga, hymns and chants at every step, the music and dance, and tasting the mouthwatering ‘malaio’ along with ‘aloo poori’ melting in rolls of white butter, made my short stay very gratifying. On the whole, Varanasi is indeed a treat, with its bedrock of Indian culture, taking you deep within your inner space. The trip was made magical for me by Heritage Getaways, a travel company in New Delhi, which makes all my travel dreams come true. Mode of transportation to Varanasi: Train from New Delhi railway station to Varanasi— a 24-hour journey. Local transportation: A scooty or auto ride is the best. Best months to visit: All through the year. Attire: Casuals, salwar kameez, jeans, long kurtas, long t-shirts, sneakers, and sandals. Things to do: Visit the Kashi Vishwanath Temple, Sarnath Stupa, a boat ride on the Ganga, the Ganga aarti, and the Heritage Fort.